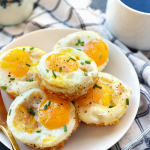 We’re taking baked eggs to the next level with these Sweet Potato Hash Egg Muffin Cups! These little baked egg cups of heaven are made with a homemade sweet potato hash, an egg, and salt and pepper, to taste! Over the past few months, I’ve been trying to find ways to keep high-protein, low sugar snacks around my kitchen. For some reason, I always gravitate towards sweeter, high-protein foods. The base of these baked egg cups is made up of grated sweet potato, cheddar cheese, and a little bit of garlic. I love the flavor the grated sweet potato gives these egg cups…so good! Plus you get a dose of complex carbs, fiber, vitamin a & c, and manganese. You crack an egg on top, season with salt and pepper and bake ’em! It’s as easy as that. Then you’ve got snacks/breakfast ready for the entire week. Bingo, bango, bongo. Like I mentioned above, we tested this recipe many many times. At first, we were trying to go for a super crunchy base with the sweet potatoes…but the only way to do that is to deep fry them, which not only adds more fat calories to this recipe but also more time. We settled on a softer hash bottom, which is just as delightful in flavor and takes way less time. Here’s how to get the most perfect sweet potato hash muffins! All you have to do is grate the sweet potatoes and put them into a muffin tin. There is no need to press the grated sweet potato down. Actually, we found that by not pressing the sweet potato mixture into the pan, the egg kept everything together better that way. SPRAY SPRAY SPRAY your muffin tin. You could even use a muffin liner if you don’t want to worry about messing up your pan (try these reusable liners to save on paper use)! The longer you bake your egg cups, the harder your yolk will be. If you like a runnier yolk, try baking for less time! Store your baked eggs in an airtight container in the refrigerator for up to 5 days. Reheat egg cups in the microwave for 30-60 seconds. Option to swap the sweet potato hash for normal hash (grated potato). How do you make baked eggs? If you’re looking to make normal baked eggs, I have a super simple tutorial on how to bake eggs in the oven. Essentially you crack eggs into a muffin tin, season with salt and pepper, and bake to your liking! How long do you cook an egg in the oven? I recommend baking eggs in oven for 13-15 minutes depending on how you like your yolk. Yes! Baked eggs are a great source of protein, low carb, gluten-free, paleo, and Whole30-approved! How do I bake sweet potato hash? There are many ways to bake sweet potato hash, but I prefer to do this either on the stove top or in the oven. This recipe includes the oven variation, but if you’d like to eat sweet potato hash by itself, I suggest pan frying in olive oil for 5-10 minutes! Easy! All you need to do is use a cheese grater to grate a sweet potato. My favorite way to make sweet potato hash brows is with a little bit of cheddar cheese and garlic powder. Scroll down to see my recipe. Reheat the next day in the microwave on high for 30-60 seconds. Wow. Has it been a heck of a week. I can’t tell you how many positive, supportive, and awesome messages I’ve gotten from all of you regarding the Healthy Glow Collective. If you are part of the #HGCcommunity, you know what I’m talking about. There is just something about a community of women coming together to do life. Not perfectly, but balanced, real, and raw. Do you FEEL ME? Delicious food, sweaty workouts, and a place to go when you are stressed or have questions. If you are not part of our Facebook group yet, join NOW. Let’s talk about business for a second. It’s been really fun and “special” to start a business during this time in my life compared to where I was when I started Fit Foodie Finds. When I started FFF I was 20 years old, right out of college, with zero business experience and zero life experience. I’ve spent the past 6 years doing and learning and making mistakes and taking risks. I have learned invaluable lessons about content creation, digital marketing, photography, cooking, taxes, human resources, and so much more. So this time around, starting another business feels different. I feel confident and excited on a whole different level than with Fit Foodie. One thing that has changed dramatically this time around is having a team. This business has never been an I or me…it’s been a WE. Monique and Katie are a dream to work with and I am so excited to venture into the Healthy Glow Collective with these two amazing women by my side.